From straightening to curling, the SinglePass Compact offers full styling capability in a portable size with the added convenience of a heat resistant cap for quick storage and ease of travel. 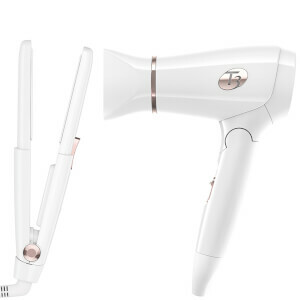 This styling iron can be stored at the office for quick touch ups or inside your purse, gym bag or carry-on luggage ensuring your tresses stay perfectly styled no matter where your busy schedule or travels take you. Digital heating technology so advanced, it takes the conventional styling iron into the realm of artificial intelligence. Regular irons test their plate temperatures in intervals, causing heat fluctuation and damage due to over-styling. T3 SinglePass Irons have a microchip brain that constantly measures and adjusts the temperature across the plates for even heat with no hot spots and no damage the entire time you are styling. Resulting in a long-lasting, smooth and shiny finish. 0.8" Fixed, Beveled Plates: Allow you to style flips, add body, or shape waves and curls in one snag-free glide. Tourmaline + Ceramic: Seal the cuticle to fight frizz and enhance shine. Digital T3 SinglePass™ (Fixed 410°F): Ensures even heating for fast, non-damaging results. 1 Hour Auto Off: For worry-free styling. Heat Resistant Cap: Covers hot plates, keeping iron shut for easy transport and storage. 8ft, 360° Swivel Cord: Prevents cord from getting tangled or twisted. Start with dry, detangled hair. Section hair using hair clips. Take a thin section that is as wide as the length of the iron plate. Slowly glide the iron through the section from roots to ends. Repeat on all sections until hair is fully styled.